Los Angeles, Ca. (June 11, 2012) – As the sun sets on the South Bay this summer, more than 1,000 Angelenos and friends will come together once again for an entertaining, yet meaningful evening to raise money for local non-profit Walk With Sally as part of the organization’s sixth annual White Light White Night gala. 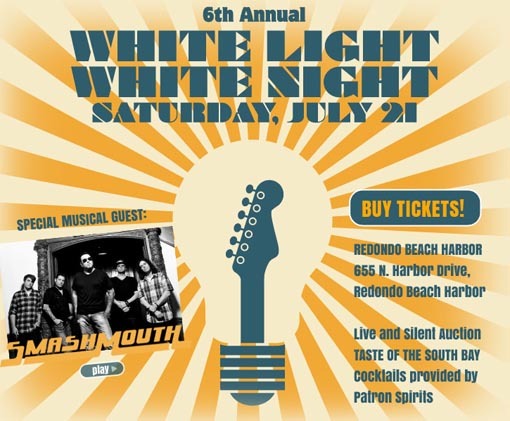 On Saturday, July 21, King Harbor in Redondo Beach will transform into a sea of white, as supporters from across the country will sample bites from some of the South Bay’s best restaurants, enjoy a cocktail from Patron’s famous Ice Bar, and bid on the evening’s premium silent auction, whose proceeds go directly to Walk With Sally’s programs. In addition, guests will be treated to a live performance by musical guest Smash Mouth. “This year, Walk with Sally’s goal is to raise $250,000 in order to serve the more than 200 children in Los Angeles that could benefit from Walk With Sally’s mentorship program. By next year, we hope to increase mentor relationships by 30% and open a new Walk With Sally center,” says Arquette. Featured restaurants will include Manhattan Beach’s Strand House, Hermosa Beach’s Hot’s Kitchen and Santa Monica’s Brick & Mortar, among many others. Tickets for White Light White Night go on sale Monday, May 20th. For more information about White Light White Night, please visit the Walk With Sally website at www.walkwithsally.org. WHAT: Walk With Sally invites the community and friends to attend the 6th annual White Light White Night fundraiser, concert, auction and cocktail party in their favorite all-white attire. This party has been recognized as the South Bay’s premier “summer chic” event, complete with a celebrity packed red carpet, a variety of L.A.’s best eateries, exclusive performances and silent and live auctions featuring one-of-a-kind products and experiences. WHEN: Saturday, July 21, 2012 at 5:00 p.m.
tickets on sale now at www.walkwithsally.org for $150. Proceeds from White Light White Night to benefit Walk With Sally, a South Bay nonprofit organization that provides free-of-charge mentoring support programs and services for children across Los Angeles who are living with or have lost a parent or sibling to cancer.